had to remove some food & other items from cupboards because after operations in 8 hours will have 2 weeks of pain & will not be capable of reaching in cupboards, 4 months total recovery. WOW the garage looks fantastic. I need to do mine.....but need to work on getting shelving or some way to organize. Lin - Sending you loads of good thoughts and prayers for a very speedy recovery. Getting what needs to be done before Fridays operations, other stuff at home I can do while recovering for a few months. YEAH!!!! I got all the stuff on my to do list done - plus a few extras. Just finished 2 quilted placemats to donate to "Meals On Wheels"
Batch cooked last night. Today laundry, grocery shopping and watch a movie that I didn't finish yesterday. Ready for AM, I have my laundry sorted and the first load in the machine. I'll pop it into the dryer in the AM and do the other load. Working on my office. I have let things get messy in there since my Dad died early this month. We are staying at my MIL's until the kids and I move to NC to join hubby. School is out on June 1 and we move June 3. My MIL will put her house on the market shortly after we leave so I am trying to keep our mess to a minimum. It is hard since one child is sleeping on the couch, one on an air mattress in the loft and the oldest and myself each in a bedroom. Plus we have a month's worth of stuff for each of us and some important things we didn't want the movers to pack and take down. Just trying not to stress my MIL out too much. Today is laundry and some phone calls to set up an orthodontist in NC to continue treatment on my son and start on my other two. Will work on organizing apartment remaining month for 2 operations on June 1. I will be on a walker so need to rearrange items & move some items to lower cupboards to use for cooking. Gosh can't believe I need to pick up all the clutter again.....how does it happen so quickly??? But, it is a cloudy day and good day to stay inside a putter around the house. Tuesday - got all things done on my planned list and even did a great 4+ mile walk around the bay with friends. Now I'm ready for a hot show and going to bed. Scrubbed by hand my apartment patio deck 2 times ,after sweeping it & washed rails, windows on patio, 3 hours total work. Everything sticks to it, mops will not work. Did my routine cleaning yesterday and organized a bin in the basement, many more to go, lol. 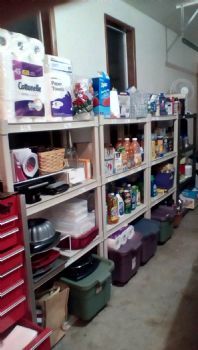 One by one, I have been purging each room and the garage and taking multiple trunk loads of things to drop off at St. Vincent Depaul's!.... .... Where does it all come from LOL!... And keeping the kitchen really clean and tidy since I went through it and organized it this month. 2 years ago I planned on moving and found out on blood clots & could not move, I live in a apartment & had packed some items before this in a corner area of my apartment along with stacked unpacked boxes. Today because of 2 June operations & still not being able to move I moved everything & folded up & recycled 40 unpacked boxes, have about 8 left & reorganized my packed items that I am not unpacking because I will move later when I am healed in 6 months. I also went through some papers for recycling. I spent over 2 hours total on both projects! I went through all clothes, summer & winter to see what I need to buy & what to donate, I leave my clothes out year round because of off season sales, I know what to buy. I packed away the winter items, donating all that were not used this season. I also went through all the patio/party supplies, in preparation for the upcoming summer. I found that I do not need to buy any supplies, just use what I have! Today was the last push to clean up our house before we hand over keys to the new owners on Monday morning. We scrubbed all the tile and wood floors, cleaned the bathrooms and kitchen, vacuumed all the carpet, picked up the yard and mowed one last time. In the middle of all that, my youngest son had his soccer game. Craziness! Now it's a month of rest for me as we finish up the school year here in OH, living with my MIL, before heading down to NC to join hubby in our new house down there in early June. The movers emptied the house today and everything is on the truck on it's way to NC! We went behind them and picked up and dusted as they got things out. We'll be there tomorrow to clean and get the last little bits out. Trash and recycling come Monday morning and we sign papers Monday at 9. It's going so fast! Hi All and Happy May a day late ------ sorry. We finally have some rain here, but we are not used to it. I was suppose to walk with my walking group last evening and since it was a chance of rain and light sprinkles......we canceled. We are such weather wimps here in San Diego.......but the first to complain about lack of rain.